Ubiquiti NanoStation Loco2 provides a breakthrough in cost, reliability, and performance! Features up to 10km of range performance, 25+Mbps of throughput performance, and the powerful, intuitive AirOS by Ubiquiti. 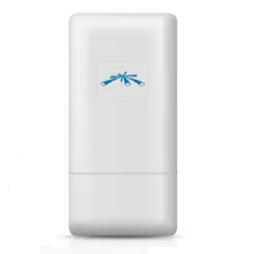 NanoStation Loco is the latest innovation in broadband wireless CPE technology from Ubiquiti. Although approximately half the size of the original Ubiquiti Nanostation, NanoStation Loco still exhibits outstanding antenna performance. The NanoStation Loco2 contains an 8dBi dual-polarity internal antenna and will operate from 2400MHz to 2500MHz. NanoStation Loco has been proven in extreme temperature and weather conditions. Additionally, it has advanced ESD/EMP immunity design to protect against common outdoor radio and ethernet failures and eliminate truck-rolls for carriers. NanoStation Loco ships standard with the powerful and intuitive AirOS by Ubiquiti Networks. It also is supported by a Linux SDK to encourage open source development. Pole Mounting kit comes standard with each NanoStation Loco. NanoStation Loco2 is built on a 100mW radio with -95dBm sensitivity and an integrated 8dBi antenna. 1m SMA male to SMA male cable Mikrotik RouterBoard RB4011iGS+5HacQ2HnD-IN-US (US and Canada) Powerful 10xGigabit port router with a Quad-core 1.4Ghz CPU, 1GB RAM, SFP+ 10Gbps cage, dual band 2.4GHz / 5GHz 4x4 MIMO 802.11a/b/g/n/ac wireless and desktop case - New! Mikrotik ACGPSA is standalone active GPS antenna, that works in 1575.4 MHz spectrum - New!